This is going to sound really cliche but I think girls spend way too much time putting on make up. If I’m being completely honest with you most boys are dumb and don’t even notice anyway. You see pictures of celebrities in magazines and you want to look like them, these photos are so photoshopped that no amount of make up will ever make them look as good as they look in those photos. While make up might give you confidence only wear make up for the right reasons. If you are wearing make up to try and impress someone, one day they are going to see you with out make up on. If you are wearing make up to try and hide your face don’t! Be proud of who you are show the world your inner beauty. You don’t need these cosmetics to be beautiful. Just like money can’t buy you happiness it can’t buy you beauty either. 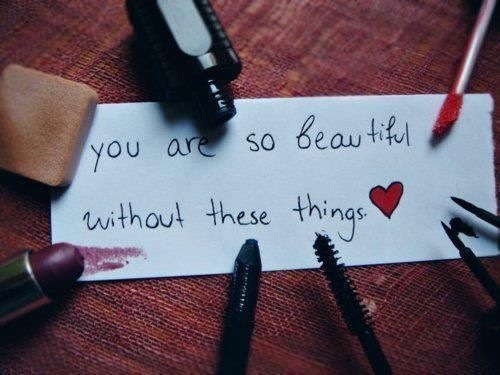 Remember that you as a person can be so much more beautiful than any amount of make up can ever make you. My challenge for you, go to work one day this week without make up. Don’t just go to work though, go to town show everyone how beautiful you can be without make up and don’t look back. Have the confidence to be beautiful without feeling the pressure of having to wear makeup. Choose a shade that is complimentary to your lipstick shade. The magazine is doing an October issue called “The Body” that will feature naked athletes.